I've been planning to post this "edit" since the beginning of June, when we got to enjoy a lot of sunshine :) but choosing the products to feature was harder than I thought. 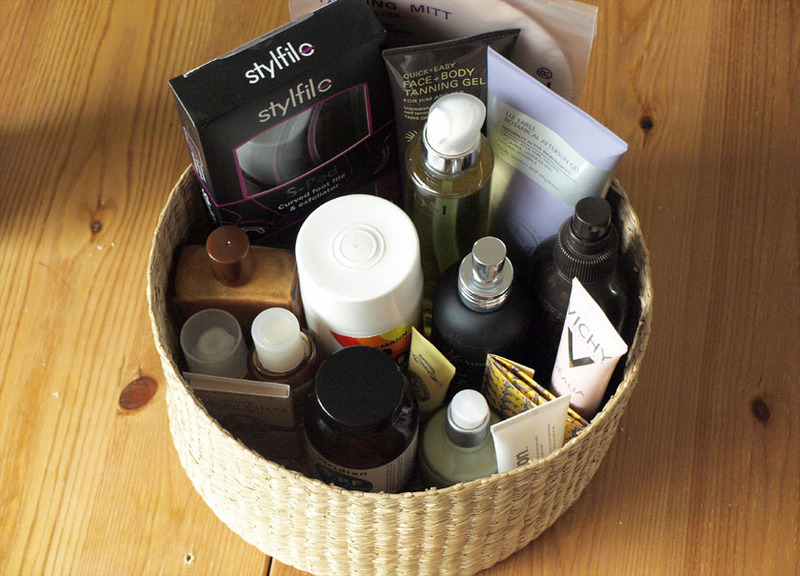 When I was preparing this post, I put over 30 products in my summer basket, but I managed to narrow it down to 17 :) Most of them are products I discovered recently, but I also included some of my all time favourites. On my body, I use Riemann P10 (or P20) and a Piz Buin Tan Intensifier with SPF 15. 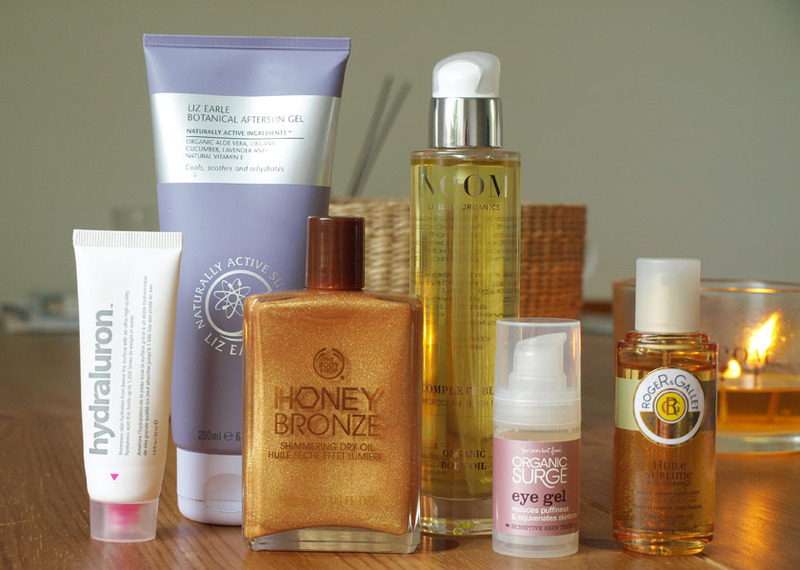 The first one is my all time favourite and a product I repurchased many times. It is water resistant and lasts on the skin for 10 hours, making it perfect for everyday use in summer or when you go on holiday. It is currently on sale on Amazon for £9.99 (here) - perfect time to stock up! The scent of the Piz Buin Tan Intensifier reminds me of summer and that's why I can't imagine sunbathing without it! It really helps to get a long lasting tan and I highly recommend it. I buy Piz Buin products from Boots or Superdug, when they are on offer. The normal price is around £10.00. 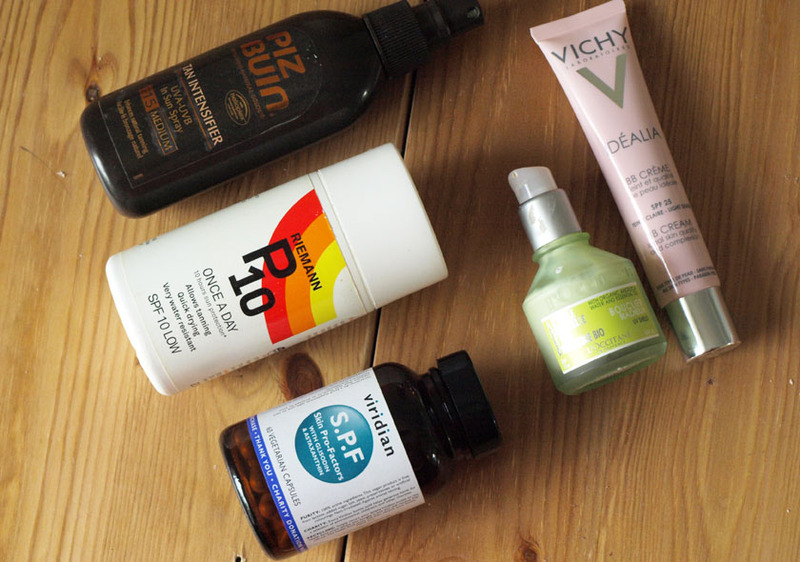 I recently discovered, that you can take SPF capsules to help protect your skin from the sun. 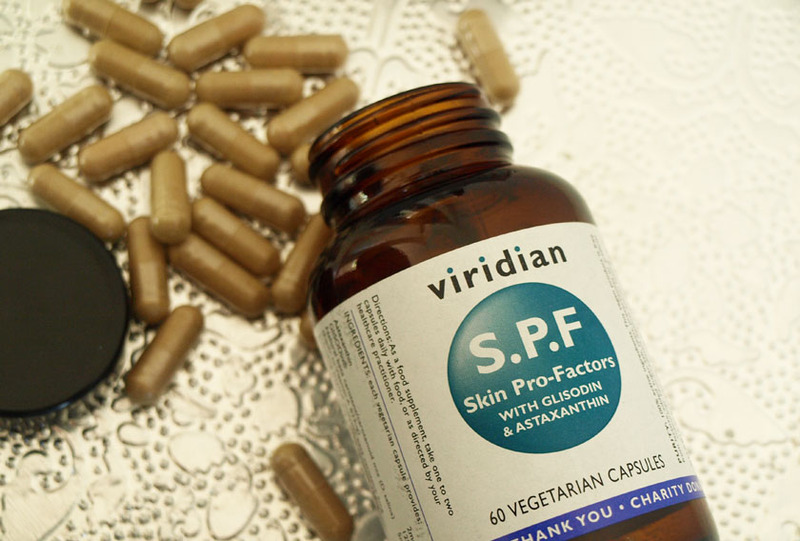 SPF SKin Pro-Factors*(£15.65) by Viridian are formulated to be taken during the summer months, but they DO NOT replace the need to use sunscreen. The capsule contains GliSODin known for promoting cellular health and the production of the body's own antioxidants. I think that the capsules are a fantastic idea, especially for people with pale skin, who burn easily (like my husband). Wearing tons of makeup in the sun isn't my favourite thing and I generally try to avoid it on hot days. To add a little bit of coverage and reduce the appearance of imperfections, I reach for BB creams and tinted moisturisers. 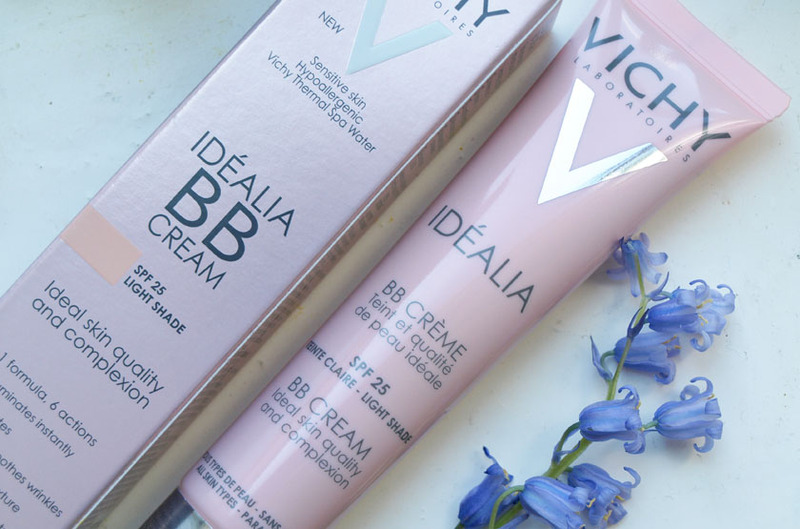 Vichy Idealia BB Cream* is my new favourite in the BB Cream department and I love using it as an everyday base. It is a great multi-tasker, offering SPF 25, hydration and medium coverage. It instantly smoothes fine lines, covers minor imperfections and adds a beautiful glow to my face. 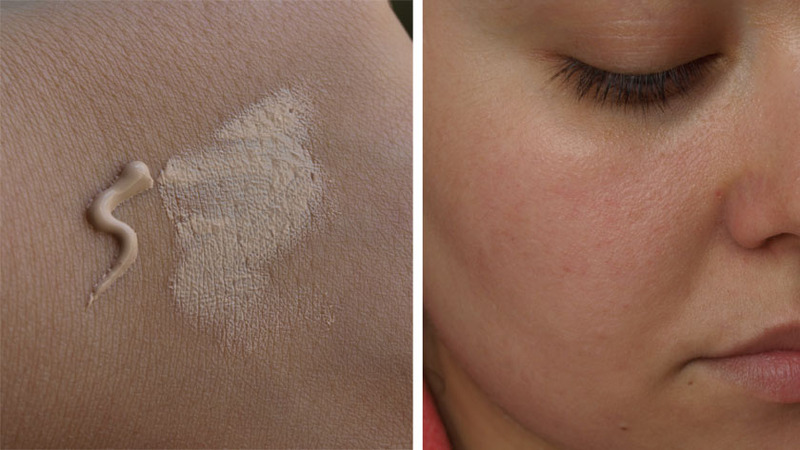 It is available in two shades (light and medium),designed to adapt to different skin tones. Shade light looks very natural on me and it is a perfect match. You can see on the photos below, that the product looks very skin-like on my face. I am super impressed! On top of that, the formula works deep in the epidermis to correct discolouration and restore a natural glow. 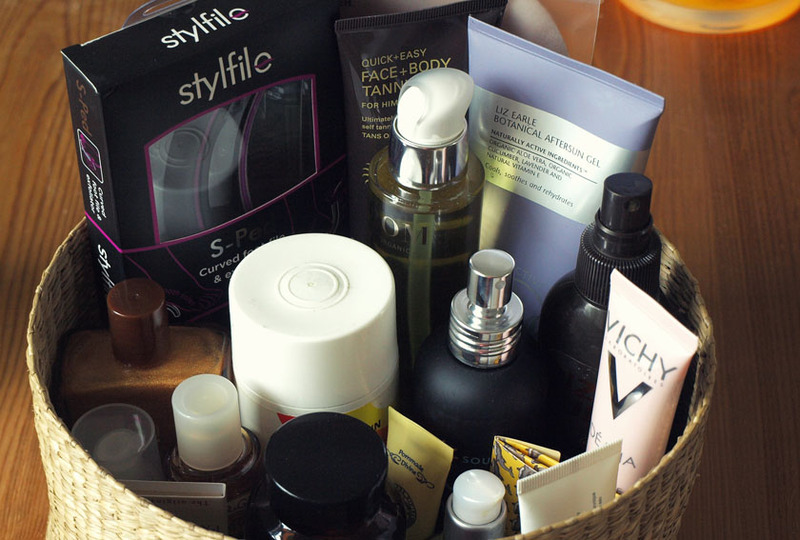 You can buy it from escentual.com , who offer up to 1/3 off French Pharmacy brands until the end of June. The BB Cream is currently reduced from £21.00 to £14.00! Bargain! It is very important to keep your skin hydrated, especially after sunbathing. 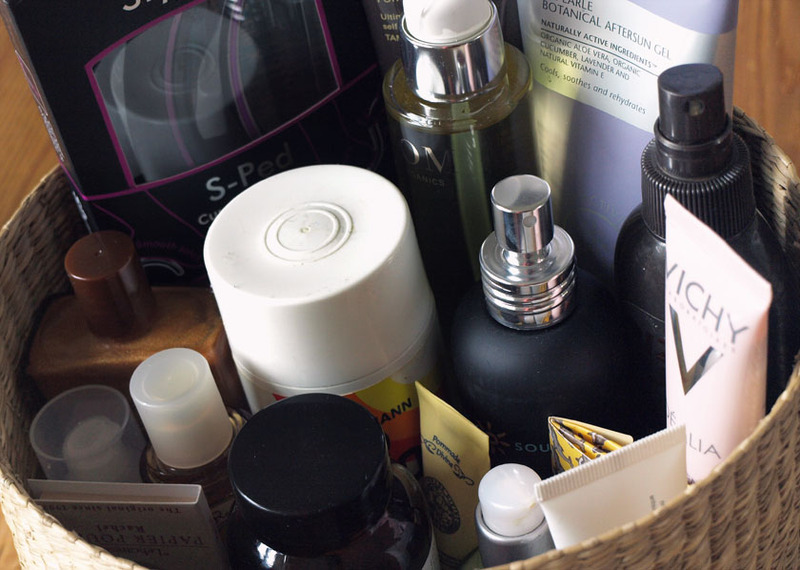 I get terribly dry skin after spending time in the sun and I always need oils and gels to repair the damage. To instantly soothe the skin, I love using the Liz Earle Botanical After Sun Gel. With it's 92% aloe vera content, it cools and calms the skin, making it feel soft and hydrated. It is a must have if you are going on holiday, retailing at a very affordable £13.50 for the 200 ml tube. 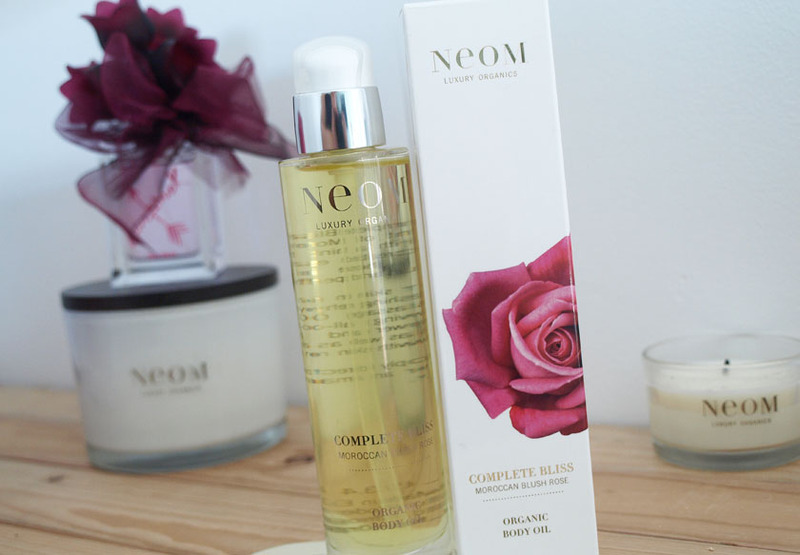 To repair the skin and restore moisture, I have been using the NEOM Complete Bliss Organic Body Oil* (£30.00). It is the most luxurious body oil I have ever tried and it smells absolutely incredible! Complete Bliss is a blend of Moroccan Blush Rose, Black Pepper and Lime, making it a perfect, uplifting summer scent. I use it after showering, to lock moisture, or on dry skin, when it needs some TLC. Complete Bliss Body Oil leaves my skin super soft and plump, without an oily residue. Enriched with organic Safflower, Jojoba, vitamins A & E and essential fatty acids, it is perfect to keep your skin nourished during the summer months. 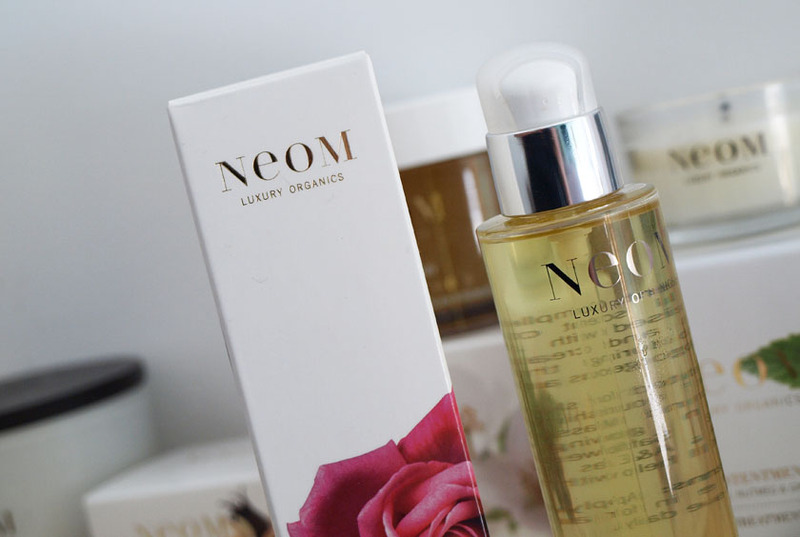 If you are looking for a luxurious oil, made with natural and organic ingredients, I highly recommend trying NEOM Organics. 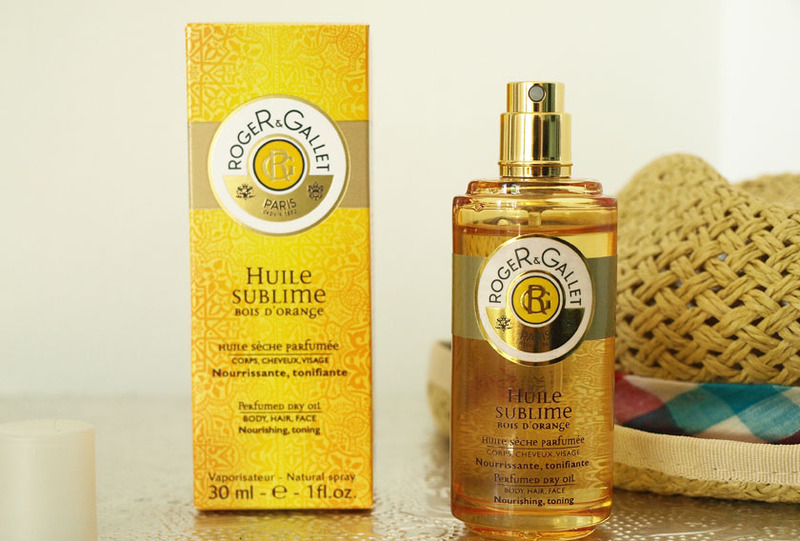 I mentioned the Roger & Gallet Huile Sublime D'Órange Dry Oil (£8.40) in my favourites post and my recent haul. I received a 30ml sample a couple of weeks ago and decided to stock up immediately :) haha. I will probably go for the 100ml bottle the next time, because I am addicted! It is a perfumed dry oil and can be used on your body, hair and face. I haven't used it on my face, but I love massaging it into my skin every morning. My favourite part must be the beautiful scent of orange essential oil, known for it's toning properties.The formula is also enriched with with 6 active plant oils and vitamin E to nourish and soften the skin. Summer wouldn't be the same without shimmering body oils! Oh my.... I adore them! 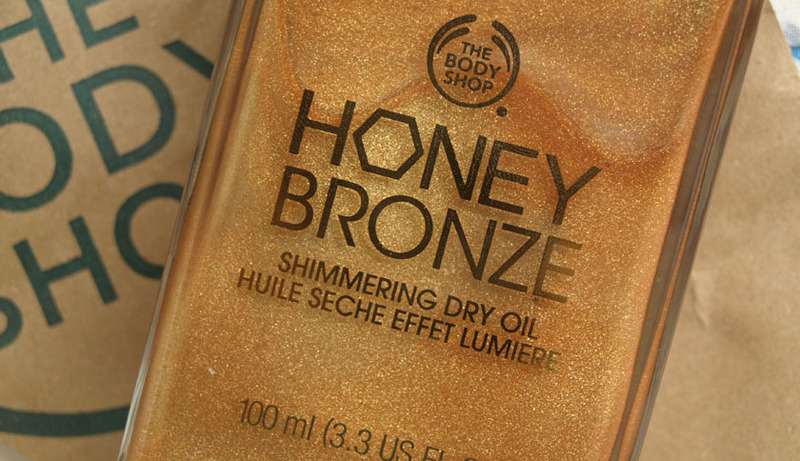 My most recent purchase is the Honey Bronze Shimmering Dry Oil by The Body Shop. I got it with a 40% discount code recently, but it retails at £16.00. I got the 02 Golden Honey option and I am in love with the way it looks on my skin. It leaves subtle shimmer, without looking to sparkly and helps to enhance a tan and nourish the skin. It smells amazing too! Perfect! Another area I am always concerned about is the delicate skin around my eyes. I use eye creams and eye serums every day, but the Organic Surge Eye Gel* (£8.49) seems to be the most soothing one. The light gel formula helps to cool the skin, feels very refreshing and it is suitable for sensitive eyes. Enriched with Aloe Vera and Green Tea, this product is a great choice to hydrate, reduce the appearance of dark circles and puffiness. I am also using Hydraluron allover my face and around the eye area after toning my skin,but I am sure that I raved about this product already. 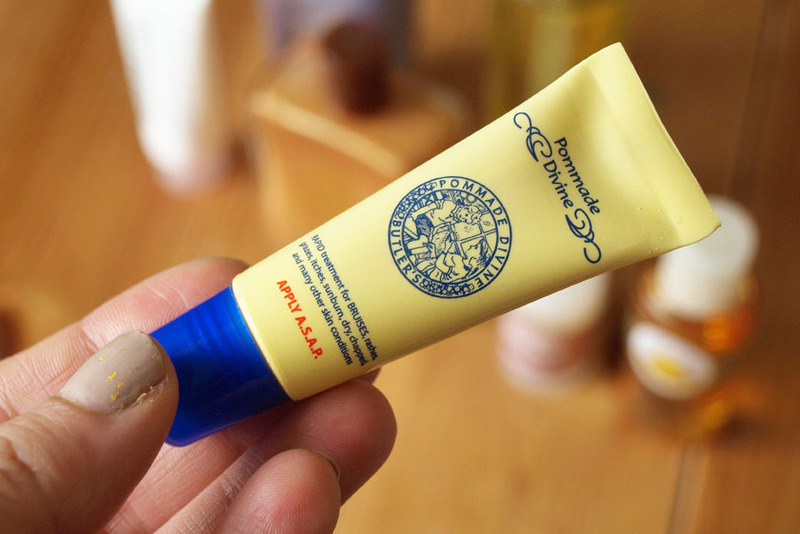 I thought that I will only need it in winter, because central heating was drying out my skin terribly,but... the sun has a similar effect on my poor face :( I am finishing my 3rd tube right now and I will be purchasing a new one asap! Hydraluron makes my other products perform much better and keeps my skin super hydrated. 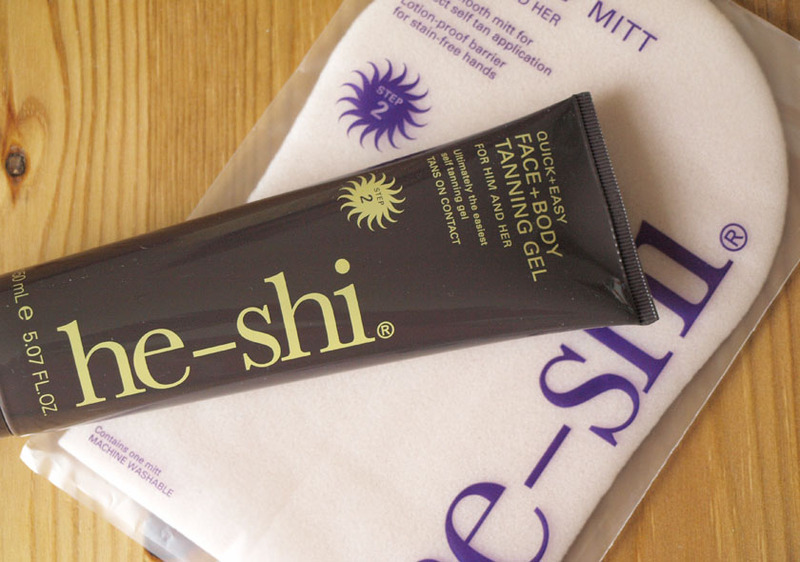 We don't get enough sunshine in the UK, so fake tanning became my weekly ritual :) One of my Holy Grail self- tanning products is He-Shi Express Liquid Tan. I reviewed it on the blog last year and I am still a massive fan. It is totally hassle free and gives me a gorgeous colour. 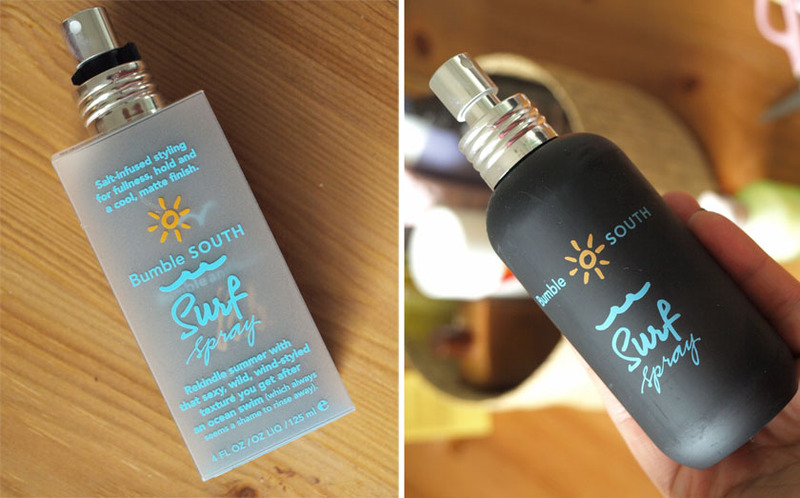 If you love the look of effortless beach hair, you probably own a bottle of the Bumble and Bumble Surf Spray* (£19.50). I adore messy hairstyles and I use various products to add more volume and lift the roots. In summer, I tend to go for salt sprays. I only used this one twice, but I love the effects! After washing my hair, I dry it with a towel, wait about an hour and spray a generous amount of the Surf Spray onto the ends of my hair. Instead of letting it dry naturally at the final stage, I use a hairdryer with a diffuser to add more volume. The spray adds a lot of texture to my fine, straight hair and makes it look "messy on purpose". If you have straight hair (like me) - the spray is not going to give you waves or curls. I don't know where people get this idea from. I try to avoid using salt sprays on my scalp, but working a small amount into the roots didn't cause irritation. I can feel the product in my hair, but I am used to it, because I usually go for dusting powders. 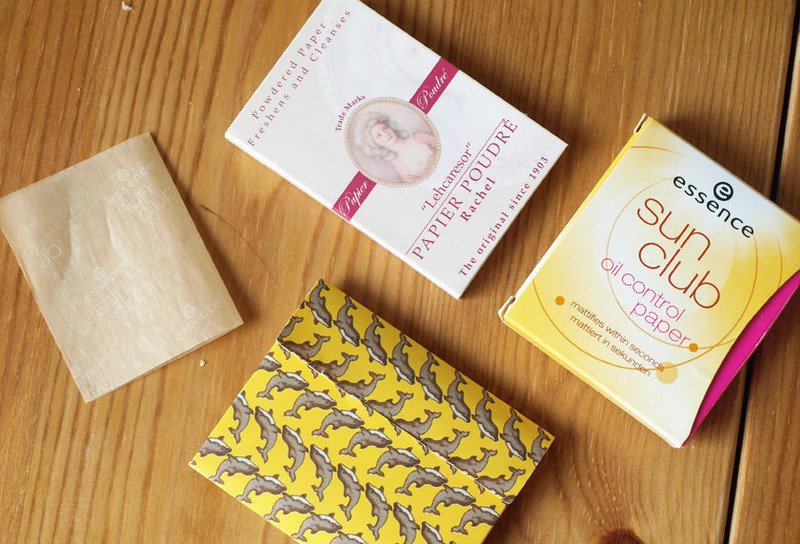 Another summer must have for me - blotting papers! On hot days my T-Zone goes crazy and to keep it under control, I reach for these bad boys. They are hassle free and I always keep a packet in my handbag. To combat dry lips, I am using the amazing Pommade Divine. It is deeply nourishing and keeps my lips super soft. I have tried many lip balms, but this one quickly became my favourite. It is a multipurpose product and can be used anywhere on your body. I also like applying it to my knees and elbows. You can buy 3 x10ml tubes, a 30ml jar or a 50ml tube from Cult Beauty. Let's face it - most people hate feet and try to avoid this subject. I am one of them! I can only look at baby feet, without feeling sick :) Adult feet are a no, no and totally freak me out! I don't worry about it too much in winter, but when I wear sandals in summer, I want my feet to look as good as possible. 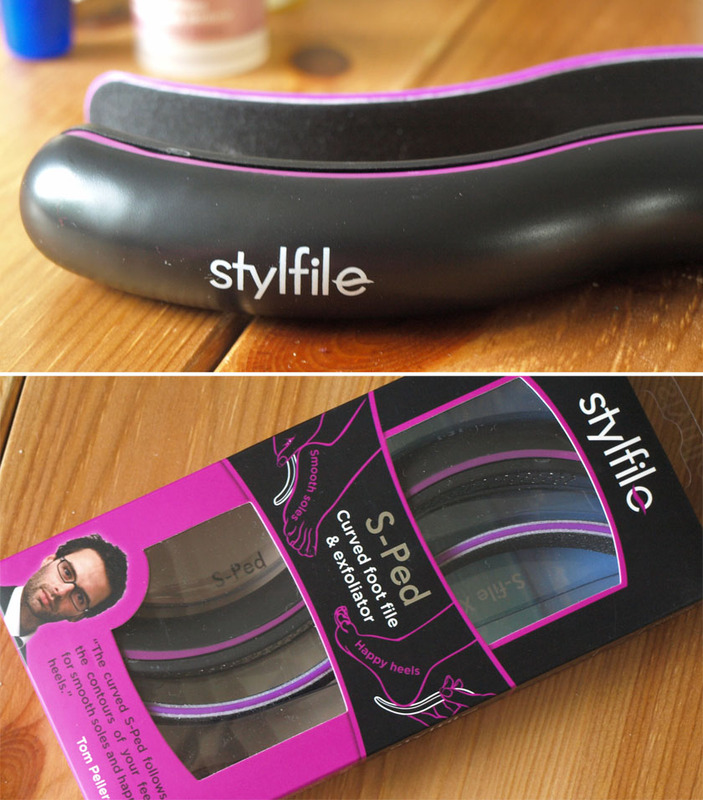 I use a couple of different tools for my weekly pedicure, but I find the Stylfile S-Ped* the easiest one to use. 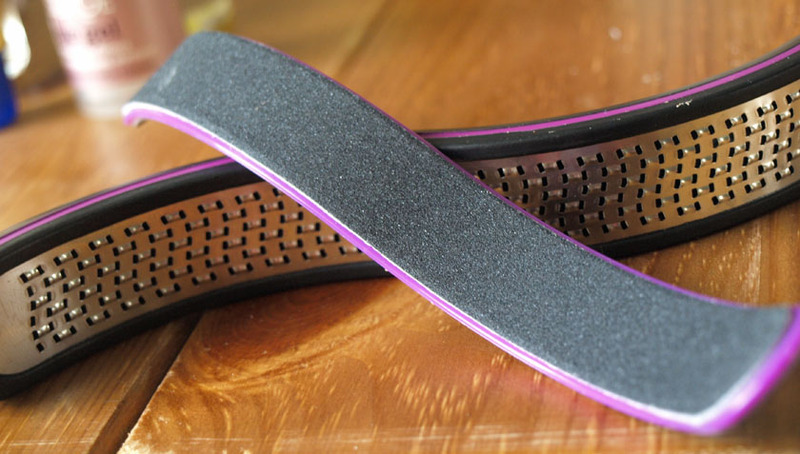 The curved shape makes it very comfortable to hold and the double sided emery file works like a dream, by buffing away dry skin and revealing soft and smooth feet. You can buy it from Boots, Amazon and Sainsbury's for £8.99. Stylfile S-Ped was designed by Tom Pellereau (the winner of The Apprentice 2011), who also designed the Nipper Clipper (for cutting baby nails). I am still on a mission to get one, but it is sold out everywhere!